With the exception of her late husband, Gene Roddenberry, there may be no one who did more to promote the world of Star Trek than Mrs. Roddenberry, who kept "The Great Bird of the Galaxy"'s vision alive after he died in 1991. Television shows Earth: Final Conflict and Andromeda, both inspired by the works of Gene Roddenberry, were produced under her guidance. More visibly, she was the only actor to have performed on all six Star Trek series: as Number One in the rejected pilot for The Original Series, then as Nurse Chapel once it was picked up; as a voice actor on The Animated Series; as Deanna's mother, Lwaxana Troi, on The Next Generation and Deep Space Nine; and as the voice of the computer in TNG, DS9, Voyager, and Enterprise ("In a Mirror, Darkly"). Her final work before passing away from leukemia was to continue providing this continuity as the voice of the computer in the upcoming Star Trek film, originally set for release on December 25th, 2008, and now scheduled for May 8th, 2009. There have been hundreds of people to contribute to the Star Trek legacy over the years, and I mean no disrespect to the likes of William Shatner, Alexander Courage, and Rick Berman. But without Majel Roddenberry, I suspect Gene Roddenberry's universe would've become something far different than it did. Thank you, madam, for the hope you gave us; may we prove worthy of you and your husband's work. A sad day for all Star Trek fans. Thanks for letting us know. 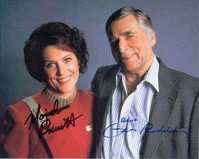 Read about Majel Barrett-Roddenberry's public memorial at TrekMovie.com. LOS ANGELES – The creator of "Star Trek" and his wife will spend eternity together in space. Celestis Inc., a company that specializes in "memorial spaceflights," said Monday that it will ship the remains of Gene Roddenberry and Majel Barrett Roddenberry into space next year. The couple's cremated remains will be sealed into specially made capsules designed to withstand the rigors of space travel. A rocket-launched spacecraft will carry the capsules, along with digitized tributes from fans. The Roddenberrys' remains — and the spacecraft — will travel ever deeper into space and will not return to earth, company spokeswoman Susan Schonfeld said. Story continues at Yahoo! News. Hat tip to Showbits reader GeneD.